RS Aggarwal is a well-recognized name commonly famous for providing the best study material for preparation of various entrance exams. His RS Aggarwal’s Verbal and Non-verbal reasoning book is the bestseller of all times. RS Aggarwal book has been recommended by all professional institutes. In fact, by studying RS Aggarwal, you won’t be feeling any need for coaching. You can perform self or group study. SSC-CGL (Tier I and II); SSC-CHSL (10+2); SSC-FCI Grade III; SSC-CPO/SI/ASI, Income Tax etc. NTSE; CLAT; Hotel Management, LIC/GIC/ UNICO AAOs, etc. Reasoning test is basically taken to understand the cognitive abilities of the candidate which includes visual information and problem-solving skills. As our modern world is built around reading, writing, conversing and understanding things, Reasoning plays a very important role in that. The non-verbal reasoning is something beyond the language barrier. It is common for every language as it uses signs and symbols which can be identified by every human on earth. Some people have a misconception that reasoning skills are God-gift and cannot be taught. But this is totally wrong. It is just a matter of exposure. You can easily build and sharpen your Reasoning skills in no time by following RS Aggarwal. The book, A Modern Approach to Verbal and Non-verbal Reasoning comes in a two-toned cover. The book is divided into two sections: first, Verbal and the second is the non-verbal reasoning. Solving this book assures the best rank in any competitive examination. We are providing the latest revised edition for the book. Essentially the core structure remains the same, it’s the number of previous year questions that are added in every revised edition. The book carefully steers the candidate through various sections keeping the child at an optimum pace and preparing him for competitive examination. An umpteen practice questions which will surely give your preparation the desired competitive edge. The book broadens your IQ and channelizes your mind towards the right approach which needs to be followed. The book also provided fully solved examples as well as solutions to previous year’s solutions questions. There are actually three sections. First is mental ability, then you having logical reasoning and the third is the non-verbal part. In the mental ability, you will be covering topics such as blood relation (expect one question of this type in every competitive exam), classifications, serried completion, logical sequence of words, data interpretation and sufficiency, assertion and reasoning, identifying the truth statement, situation reaction, problems based over alphabets, Venn diagram, Arithmetical reasoning etc. This book covers the verbal reasoning part, which involves understanding and reasoning using concepts framed in words and numbers. This is basically testing the problem for positive or negative statements. The question such as statement-argument, Driving conclusions from passages i.e. passage comprehension, Theme detection, statement argument, statement assumption, statement conclusion. Non Verbal reasoning, as mentioned above is basically testing your IQ apart from language. Verbal reasoning is designed to check your grasp over the concepts and grasp of English/language. Non-verbal is more oriented words series completion, mirror images, water images, pattern identification, series, analogy, classification, Rule detection, problems reacted with dice, paper folding, dot situation, cubes and dice, geometry, figure matrix etc. Dr. R S Aggarwal is one of the best ever known mathematicians in India. He was born in 1975 in Delhi. He joined as a lecturer after completing his post graduation in mathematics. Later he completed his Ph.D. and was awarded the degree of the doctorate. He retired in 2003 from MMH Ghaziabad. He has written numerous books ranging from junior to higher classes in mathematics and competitive exams as well. He has also written various books on general knowledge with co-authors. Where can I download the book? Over the years, reasoning has been an important part of aptitude tests across several recruitment processes as well as for competitive examination for admission to various courses. Much success depends on a candidate’s performance in this section. You can download the latest RS Aggarwal Reasoning book PDF in a classified, well arranged, and graded manner. The book also contains a virtual question bank for practice that empowers the candidate to deal with similar questions anywhere. Download the book now for complete solutions and a clear understanding of the logic involved in the questions. RS Aggarwal Quantitative Aptitude is a single stop solution for all your entrance exams needs. It is one of the best and most effective books which is recommended by professionals for the preparation of competitive exam such as bank PO, SSC EXAMS, MBA, MAT, CAT, UPSC, Railway Recruitment exams etc. This book is also preferred by students in their campus recruitment drives as a great resource for preparation. The pattern followed in the book is as per the latest syllabus followed by the examinations. It also contains the tips and tricks for the students to save time and calculation. Students preparing for the government sector exams or public sector entrance exams must solve this book to secure good ranks. Also, students aspiring for special officer cadre and clerical cadre in various organizations also get benefited from this book. Each and Every topic of quantitative ability has been explained in a detailed manner along with the approach followed. There are solved examples for the students to get some hands-on over the topics and a better understanding of the concept. This book is indeed the best sellers of all times and is recommended even by many toppers of various entrance examinations. Almost all the entrance exams are it UPSC or CAT, MAT etc, all have a dedicated section for quantitative aptitude commonly known as “quant”. The applicant needs to clear the cut off in this section so as to be eligible for the next rounds. The book is designed keeping in mind the pattern of entrance exams. The solutions for the practice exercise are also provided so that a student can verify his/her answer. This will help to imbibe the lost confidence. All the topics related with mathematics (tips and tricks) as per the examination pattern has been solved in a very easy manner so that even a student weak in quant, is able to solve it confidently. Some of the topics covered are HCF/LCM, number system, Permutation and combination, Pipes and cisterns, square and cube roots, fractions, decimals, percentage, profit and loss, Surds and indices, simple and compound interests, ratio proportion, mixture and allegation, Time, distance, work, probability, stocks, clocks, calendar, data Interpretation and many more. In the clocks part, the distance covered by minute hand questions are very important. Students must understand the difference between when to use permutation and when to use the combination. The probability question related with dices and handshakes are very important. Each and every entrance exam definitely contains one question on profit and loss. The formulas for simple and compound interests should be on your tips. Ratio and proportion should be dealt with very cautiously as a single mistake can lead to a wrong answer. The train problems in Times and distances are very common and usually come as it is from the book. Regarding the data Interpretation part and series/sequence problems, the more questions you solve, the more confident you become. Mathematics is just a play of numbers. The more you play the finer player you become. This book is easily available in the market. But you can also download this e-book from the link given below. This will solve two purposes. One, you can download it for free and secondly, you can view it any-time in your mobile and start practicing. Surely, this book is a holy grail for the aspirants of various competitive exams. Not only RS Aggarwal, but we offer a large database of e-books and PDF for standard books and NCERT books which are free to download by the students. Even the teachers can download these books, for a better teaching experience for the students. These books can either be downloaded in PDF format or in zip file format. Whichever the user feels comfortable. You can also get into a sneak peek of the book from the PDF section before downloading. You can explore some more books here, for a better and comprehensive preparation. Hard work and dedication is the key to success. We help to provide the study material for free so that each and every student becomes competent enough to crack any exam. Register with us today and become a part of the largest and fastest growing online e-book community for school books. Keep following us here for the latest textbooks as well as NCERT solution books. We offer all the books for free. No signup required and no login as well. Just a single click and Bingo! Your file has been downloaded in the download folder of your computer. 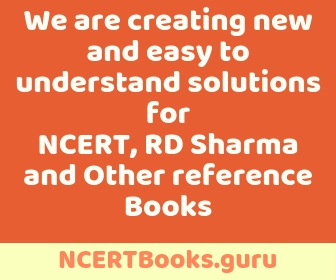 NCERTBooks.guru offers a user-friendly interface and tried & tested links. All the links are working properly without any redirection. In case you face any problem please feel free to contact us. We will be happy to help you. Let’s join hands to make this community #1 trending on all digital platforms.